Florida beach vacations can be many things. There are peaceful getaways on Sanibel Island, family fun on Florida's panhandle beach resorts, and non-stop action on the beaches of South Florida. Florida's 1200 miles of coastline and almost 700 miles of beach attract over 70 million visitors to the state each year. South Florida is known for its vibrant, Latin-influenced nightlife, beautiful people, and world-class shopping. Florida beach vacations in this part of the state revolve around beach activities during the afternoon and restaurants and dance clubs during the evening. Chief among these destinations is the South Beach area of Miami. Here sparkling white sand combines with striking Art Deco architecture, fashionable boutiques, and sidewalk cafes. If you're lucky, you'll be in the right place to see one of the many fashion and movie shoots that favor the area. Florida's west coast, from Marco Island to Tampa, offers visitors a more relaxed, quieter vacation than the resorts on the east coast. The emphasis is on beach pursuits and casually elegant restaurants, not dance clubs. Visitors to Sanibel Island, off the coast south of St. Petersburg, are rewarded with a wide stretch of sand, ideal for shelling; a wealth of low-rise, beachfront condos, and some of the best sunsets in Florida. 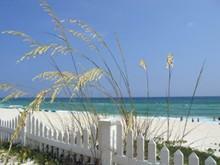 The Florida Panhandle coast, from Panama City to Pensacola has been welcoming Florida vacationers for decades. Recently the area has become popular with visitors from the north and new resorts, condos, and beachfront homes have popped up. The area still retains an "Old Florida" style, with plentiful fresh seafood restaurants, family-friendly state parks, and lots of sand. Florida's so-called "Space Coast" - that section of eastern Florida from Juno Beach up to Daytona Beach -- is lined with small beachside communities with affordable family-friendly hotels and resorts. The area is also home to the Kennedy Space Center, homebase to the Space Shuttles. If you're lucky enough to be in the area on launch day, you can see the blast-off from the beaches all along the coast. Florida's Keys extend from Miami 129 miles to Key West. The collection of small islands, connected by highway 1, includes Key Largo, Islamorada, and Marathon Key as well as Key West. Each island has its own tempo and flavor, but most offer excellent beaches, world-class sports fishing, and a casual, care-free lifestyle. Florida beach vacations need not be expensive. Airfare from most US cities to many of the resort cities in Florida remains one of travel's best bargains. Non-stop flights to Miami, Orlando, and Tampa connect the "Sunshine State" with cities throughout North America, and many other cities can reach Florida via connecting flights from airline hubs, such as Atlanta, Dallas, Houston, Chicago, and Newark. Accommodations range from luxury beachfront hotels, such as the Ritz Carlton Naples or the Breaker's Hotel in Palm Beach to quiet seaside resorts, many of which are located along Florida's "Space Coast" to condominiums of all shapes and sizes. A car rental is almost a necessity on a Florida beach vacation - for getting to the beach, shopping, going out to dinner, and driving inland to amusement parks and other attractions.